It’s time again for DemoCamp. There are a few tickets remaining. But this is DemoCamp Ramen Edition. Why ramen? Well it’s pretty easy. The first is an homage to being ramen profitable. The last event with Gurbaksh Chahal was great, my only complaint was that by 9pm I was hungry. The great folks at Liberty Noodle have offered to help us out. 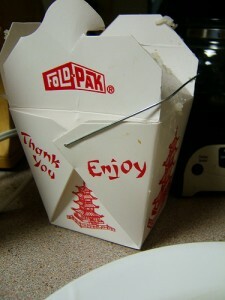 They are providing take out boxes of noodles or rice as part of the DemoCamp registration. Hopefully this should make it more tenable to spend time watching a stellar line up of local startups and a keynote. This is all made possible by our friends at SIFE Ryerson, who have recently launched StartMeUpRyerson to be the SVASE of Canada, go have a peek. April Dunford is keynoting. April is one of my favourite marketers in the world. She has lived in big organizations (IBM, Nortel) and at small organizations (DataMirror, Infobright, VersePoint). She has a wicked grasp of customer development and this #leanstartup thing. April has agreed to talk about the myths of product market fit. Well at least the challenges about figure out if you’ve got product-market fit and how to know when to begin to transition to go-to-market. This will be a must attend discussion for startups about products, marketing and corporate development. (Don’t worry if you miss April at DemoCamp, you can see Sean Ellis at MeshU). I’ve seen a few of these demos, and they are fun. It’s exciting to get to see world-class technologies and startups here in Toronto (Ottawa and Montreal). I’m looking forward to hanging out with everyone, learning from April and watching the best demos. We’ll be heading out for beers afterwards. We’re heading over to the Imperial Pub. And if you haven’t figured this out, let me help you, The Imperial Pub is a great place for a couple of beers, it’s not the place to go for dinner.